Are you trying to get to grips with taking the interests of children, particularly infants and toddlers, and linking them to ‘provocations for learning’ and ‘invitations to play’? If so, join the ECCDC’s Early Learning and Child Care Program Consultant, Ginette Wilson, for this interactive workshop that will consider the role of ‘schema play’ and offering experiences that cater to all the senses. 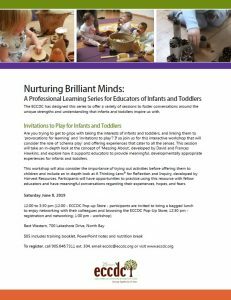 This session will take an in-depth look at the concept of ‘Messing About’, developed by David and Frances Hawkins, and explore how it supports educators with providing meaningful, developmentally appropriate experiences for infants and toddlers. This workshop will also consider the importance of trying out activities before offering them to children and include an in-depth look at A Thinking Lens® for Reflection and Inquiry, developed by Harvest Resources. Participants will have opportunities to practice using this resource with fellow educators and have meaningful conversations regarding their experiences, hope and fears.